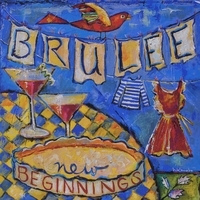 Brulée offers a completely refreshing listen that brings levity to the seriousness of jazz, filled with witty lyrics and uplifting melodies, New Beginnings – their debut CD is an on target winner. The songs are carefully designed pieces that are often wry and witty, occasionally tender and bittersweet. Typified by verbal and musical craftiness, they are songs written for adults, or at least for audiences that wouldn’t mind growing up. They are stamped with thier unique musical personality: quirky lyrics you can’t get out of your head, memorable melodies abound this wonderful new offering. “Tout Doucement/Ain’t Misbehavin” is a journey to the sidewalks of Paris of ole’. A quirky melding of cultures, Weiner takes the French perspective, while Onstad gives a truly American view. Grab a “Sidecar” folks and be sure to stop off at Harry’s Bar in Paris. “Come On – A My House/I Ain’t Got Nobody” is a swampy bluesy cut that features searing saxophone with Weiner directing this ceremony of fun filled adventures. The lyrics are centered on an invitation to her house, an interlude in the festivities “I Ain’t Got Nobody” is introduced by Onstad and offers an interesting melding of atmosphere on this highly entertaining and creative cut. A lighthearted expedition from Paris, to America and beyond, melded with zest and a sense of humor, which all add up to a delightful break in the world of serious jazz. Performed with great elan and style, in an organically produced production method, Brulée is a nice addition to your collection, adding a post-bop hipster jive to your anthology.